New tool helps producers monitor crop yield, management and weather trends by field. Cottage Grove, Wis. [November 7, 2013] – Landmark Services Cooperative introduces the YieldEDGE Viewer, a new management tool for crop growers to monitor trends by field.YieldEDGE Viewer is a web-based program that allows crop growers who are Landmark members access to the cooperative’s data on the owner’s fields in real-time, at any time. The program is free to all Landmark members. After logging into the system with a username and password, YieldEDGE Viewer shows the grower all of the data that Landmark has compiled about their operation, based on each field’s set boundary. This information can include: yield maps, fertilizer rates applied each year, soil test data, multi-year yield analysis, seed varieties planted, historical prescriptions by field and historical weather trends on the farm’s acreage. Gary Myers, YieldEDGE Precision Ag Manager for Landmark, says growers are already benefiting from the recently launched program as they’re noticing trends and then making changes based on real-time information. Producers can then log-in to the YieldEDGE Viewer and access their information whenever needed. Myers says that evaluation of the data can help growers gain the edge over previous growing years. Weather patterns, forecasts and trends are also shown through the YieldEDGE Viewer. Myers says that recognizing weather according to acreage can help with adjustments in irrigation levels, monitoring time according to growing degree days and fertilizer rates. Growers can also share data that they have collected themselves with the Landmark team to be added into their specific YieldEDGE Viewer account. All information is proprietary to the Landmark grower, is only accessible by the individual grower and used only for decision-making on that operation. Growers interested in the YieldEDGE Viewer are encouraged to contact their Landmark agronomist for a demonstration. 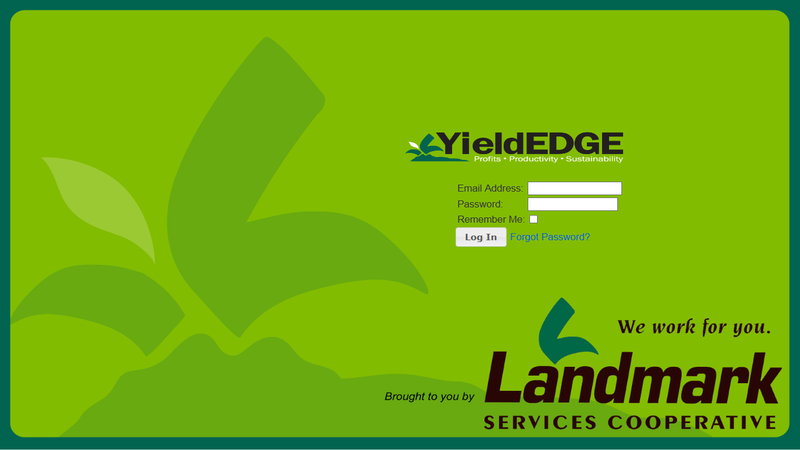 The agronomist can then set up the grower with a username and password to access the YieldEDGE Viewer site. For additional information on YieldEDGE Viewer, visit www.landmark.coop or contact Gary Myers at (608)819-3158 or Gary.Myers@landmark.coop .